Robert John Braidwood was a pioneer in the transition toward modern interdisciplinary archaeology. Robert John Braidwood was born in Detroit, Michigan, on July 29, 1907 to Scottish immigrants. In his early years, he assisted in his father’s pharmacy after school and occasionally held part time jobs (Pastmasters 89). Robert held an apprenticeship in a carpentry union during the summer prior to starting college, and the carpentry skills he acquired proved to be extremely useful years later in archaeological field camps. In 1926, Robert attended the University of Michigan as an undergraduate, and in 1929, he graduated with a degree in architecture (Watson 2007). For several months, Robert worked in an architectural office in Detroit, but because of the Great Depression, he quickly realized that a successful future in architecture would be highly unlikely. Braidwood returned to the University of Michigan for further studies in ancient history and anthropology, successfully completing a bachelor’s degree in 1932 and a master’s in 1933 (Pastmasters 90). During his studies, Braidwood was invited by his ancient history professor, Leroy Waterman, to serve as an architectural surveyor for the University of Michigan’s archaeological expedition in Selucia, an area south of Baghdad, for a nine-month field season (Pastmasters 89). This experience drove Robert to become an archaeologist, and he was immediately hired by the Oriental Institute, University of Chicago, to be a field assistant for their Syrian expedition to the Amouq, a position he held for five years (Lavietes 2003). On his return trip home from Syria in 1963, Robert ran into a young woman on the steamboat, Linda Schreiber, who he had known in his undergraduate studies at the University of Michigan; she was currently working as a buyer for a large Chicago department store (Watson 2007). The two were married in January of the following year, afterwards having two children, a son and a daughter (Lesko 2003). Both Braidwoods enrolled at the University of Chicago for graduate coursework. Robert was in pursuit of a doctoral degree in the Department of Oriental Languages and Literatures at the Oriental Institute while also completing coursework in the Department of Anthropology (Pastmasters 92). While working towards his doctoral degree, Robert also headed a meteorological training program in Chicago for the Army Air Corps during World War II (Mortensen 2003). In 1942, Braidwood earned his Ph.D., and in 1945 he acquired a full-time position from the University of Chicago as a prehistorian with dual appointment in the Department of Anthropology where he taught Old World prehistory classes (Pastmasters 92). His job was arranged so that every third year he worked in the field, excavating prehistoric sites in western Asia. Robert and Linda went on to work together in the United States and abroad for the next 66 years, leading archaeological expeditions with fieldwork in Syria, Iraq, Iran, and Turkey, as well as coauthor numerous publications based on their work that greatly impacted the direction of archaeology as a discipline. After Robert officially retired from the University of Chicago, the Braidwoods held residence in LaPorte, Indiana (Lavietes 2003). Both developed pneumonia in 2003, and on January 15, Robert died at age 95. Linda died the same day, only hours after, at age 93 (Harms 2003)	. Robert and his wife devoted their lives to archaeological inquiry, and their contributions to the field continue to live on. Robert’s first hands-on experience as a surveyor with the University of Michigan’s Selucia-on-the-Tigris expedition in 1930 instigated his passion to pursue a career in the field of archaeology. Robert served a summer on a Native American site in Illinois and operated as a field superintendent for an early village site excavation in highland New Mexico. Although he found the assignments enjoyable, he quickly realized that his true passion and interests lied with the prehistoric Near East (Pastmasters 92). Braidwood’s experience in Selucia as well as his five-year association with the Oriental Institute’s Syrian expedition in the Amouq, projects that focused on mounds involving prehistoric, protohistoric, and historic communities, were critical in the development of his interests. During his time at the Amouq, Robert performed a stratigraphic test of a mound, dividing the changing pottery strata into a long series of phases. He related his findings to other artifacts of the Near Eastern area and presented the results in his doctoral dissertation (Watson 2007). Robert and his wife participated in a seminar headed by Robert’s dissertation professor that focused on the beginning of the archaeological record of the Near East and proceed all the way to 2000 B.C. This seminar, combined with his research from the Amouq, inspired Robert to produce what would become known as “the gap chart,” in 1945 (Watson 2007). This tool chronologically illustrated a major gap spanning thousands of years between evidence of the last known mobile Paleolithic hunter-gatherers, and the earliest discovered agricultural settlements such as those found in the Amouq site. Robert’s infatuation with “the gap chart” instigated his proposition that the very first sedentary, food-producing villages must have originated at some point in this period of time (Mortensen 2003). 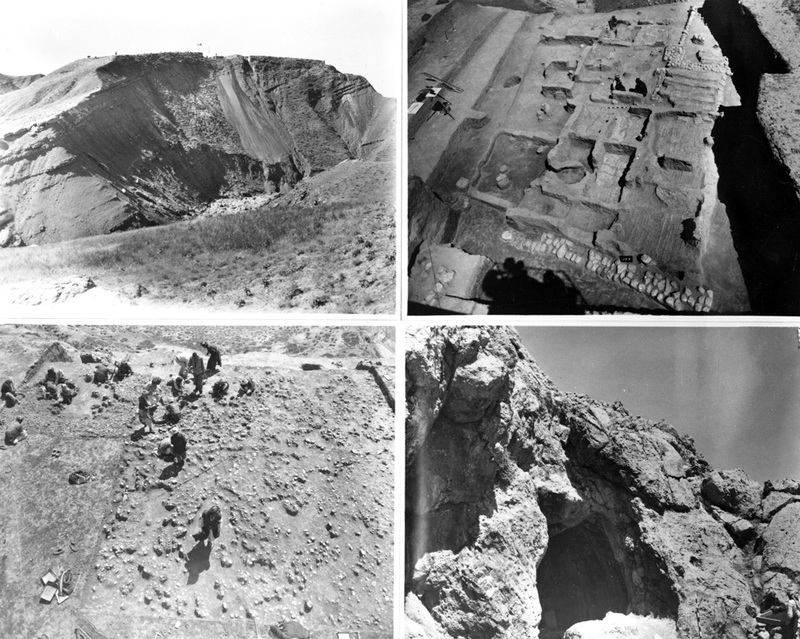 Jarmo and adjacent sites from the Oriental Institute’s 1950-1951 expedition led by Robert Braidwood. . This gap in time became the subject of the Braidwoods’ first Oriental Institute expedition post-World War II, and it set the course for fieldwork throughout their entire careers. They hoped to return to Syria for their first expedition, but because of political tension, they were urged to begin their 1948 fieldwork in northern Iraq. The Braidwoods acquired excavation permits for two sites, Matarrah and Jarmo, a site covering four acres atop a bluff, lying in the hills east of Kirkuk, Iraq. Jarmo proved to be of greater interest upon excavation for many reasons, including the fact that ceramics did not appear until the uppermost third of the deposit, despite it being a sedentary community throughout its entire existence (Prehistoric Men 129). 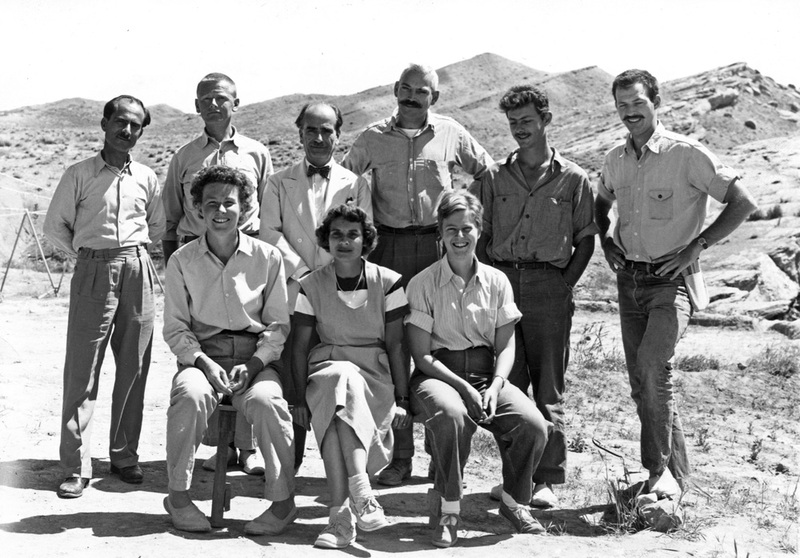 After a successful season, the Braidwoods crafted the Iraq-Jarmo Project, and completed nine months of fieldwork at several units in Jarmo in 1950-1951, accompanied by their children Gretel and Douglas, as well as geologist Herbert Wright (Watson 2007). Braidwood sought more expertise in identifying the faunal and botanical remains of Jarmo, as well as analysis of the prehistoric environment and climate, so he devised a plan to enlist a range of experts in the natural sciences to join his team for the subsequent season in Jarmo. Funded by the National Science Foundation, Robert enlisted geologist Herbert Wright, paleoethnobotanist Has Helbaek, zoologist Charles Reed, radiocarbon expert Fred Matson to assist his team of archaeologists, field assistants, and camp managers in the 1954-1955 season (Watson 2007). Braidwood’s team would help him better understand and properly identify the remains of the wild and domestic plant remains such as wheat and barley, as well as animal remains including sheep, pigs, dogs, and goats. Braidwood’s particular interest in the site of Jarmo stemmed from its geological attributes, being a well hydrated highland area where plants and animals could thrive. Robert postulated that the land could have been an ideal location to find the remains of the first farmers and pastoralists (Watson 2007). Since Jarmo was closely located to the area dubbed the “Fertile Crescent,” Braidwood eventually referred to the location as “the Hilly Flanks of Breasted’s Fertile Crescent.’” The “Fertile Crescent” was a well-watered, hilly area of rich civilizations that developed long ago in the Near East, named by James Henry Breasted, founder of the Oriental Institute (Harms 2003)	. A plan was made for a fourth season of the Iraq-Jarmo Project, however, the nationalist revolution in Iraq in the summer of 1958 created an unstable political environment in the Kurdish area where Jarmo is located. The expedition relocated to Iran in 1959-1960 under the new name of the Iranian Prehistoric Project (Watson 2007). The season began with survey of the Kermanshah valley, and excavations followed at multiple sites including a rockshelter nearby. Most of the excavation that occurred in Iran prior to World War II voided any botanical or faunal remains, which was of high importance to Braidwood’s crew, so a great deal of attention was paid to these particular details (Prehistoric Men 138). After a single season in Iran, the group once again relocated after being sought out by Braidwood’s colleague, Professor Halet Çambel of Istanbul University. The Joint Prehistoric Project, Istanbul-Chicago, was established in 1963 under the direction of Braidwood and Çambel, with the first season of fieldwork in southeastern Turkey. The field identified as main focus of the project was the site of Çayönü, a village hundreds of years older than Jarmo, possessing more intricate architecture and artifacts (Watson 2007). The fieldwork at Çayönü was identified for its great attention to detail, leaving no stone unturned. Analysis was carried out on buildings, plant remains, animal bones, obsidian rock, as well as microfauna from lakes and ponds. The Braidwoods, continued collaborating with Çambel at Çayönü until their last field season in 1989 (Mortensen 2003). Robert Braidwood’s lifelong work in the understudied area of the prehistoric Near East changed the understanding of the transition from hunter-gatherers to food producing villages and civilizations. Braidwood’s first priority as an archaeologist focused on testing the hypothesis that an agricultural revolution occurred separately and prior to the establishment of civilizations, which led to the organization of the Prehistoric Project at the Oriental Institute of the University of Chicago (Lavietes 2003). Rather than focusing solely on recognizable artifacts, Braidwood was the first archaeologist to study and analyze all aspects of material remains in the field, including pottery shards, plant and animal remains, and rubbish. His excavation strategies also led him to transform archaeology into an interdisciplinary study with his recruitment of botanists, zoologists, and geologists on his expeditions. This shifted the focus of archaeology toward the emphasis on the relationship between man and nature (Harms 2003). 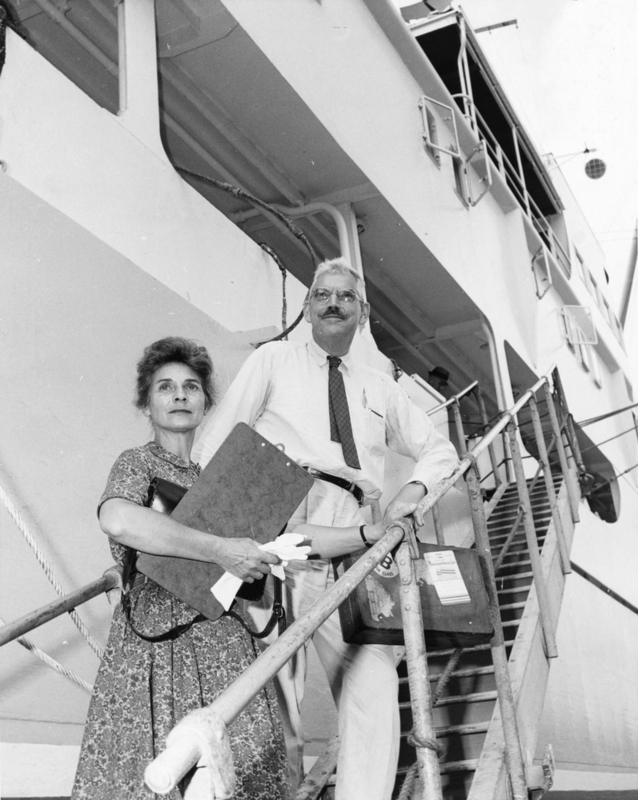 Robert and Linda Braidwood embark on an expedition in search of early human settlement in the Tigris and Euphrates Valleys in 1963. Through his work, Braidwood was able to develop chronological stages filling in part of his “gap chart” over the period from 100,000 B.C. to 5000 B.C., representing the change from hunter-gatherers to agriculturalists in settled villages along the “Hilly Flanks of the Fertile Crescent” (Mortensen 2003). The site at Jarmo dated to 6800 B.C., which happened to be earlier than any other civilization known at the time. Among many signs of established villages, Braidwood discovered evidence of animal domestication as well as crop cultivation (Lavietes 2003). The site also contained large assemblages of ceramics, which helped develop chronology at the location. His most famous discoveries, however, occurred in his fieldwork at the site of Çayönü in southeastern Turkey. This farming village dated from 7250-6750 B.C., possessing the earliest known buildings (Lavietes 2003). Other notable finds from this site including cold-hammered copper tools, such as small pins and hooks, domesticated flax, and semi-fossilized cloth that pushed back the introduction of textiles. One of the most interesting characteristics of this site was the presence of terrazzo floor, made using a technique of burned lime that was previously thought to be invented by the Romans 7000 years later (Harms 2003)	. Among numerous articles based on his studies of prehistoric archaeology, Robert also published a book, Prehistoric Men, a culmination of much of his archaeological work. Braidwood received many honors throughout his career, including a medal for distinguished archaeological achievement in 1971 from the Archaeological Institute of America (Harms 2003)	. Through his detailed methods of excavation and analysis, Braidwood disproved the theory that an agricultural revolution occurred significantly prior to the establishment of civilizations, as his evidence concluded the two were very intimately correlated (Prehistoric Men 127). Jarmo Expedition team (1954-1955) led by Robert Braidwood. In his many years of work, Robert Braidwood proved to be a pioneer for modern methods of archaeology with his innovative and groundbreaking work throughout his career. His points of focus throughout his studies and employment of interdisciplinary colleagues transformed archaeology from a field focused on the recovery of artifacts for museum display to a study of the process of change and human evolution (Lavietes 2003). Braidwood’s persistence to include various science disciplines in his archaeological inquiry has not only prevailed in modern day archaeology, but it has even developed a series of subdisciplines including archaeobotany, geoarchaeology, and zooarchaeology (Watson 2007). Braidwood is also credible for the implication of various technologies into analysis methods. The Braidwoods’ commitment to the Oriental Institute Prehistoric Project as well as the Joint Turkish Prehistoric Project led to their inevitable establishment as well-respected projects with staff members from all over the world (Watson 2007). The chronology that Braidwood established throughout his career is still accepted as accurate, and is a guide for prehistoric archaeological inquiry in the Near East and other parts of the world. His devotion to the study of the agropastoral origins has been survived by interdisciplinary teams around the world, and the investigation of agricultural revolutions still persists. The systematic, interdisciplinary field research method that Braidwood established throughout his career continues to set the standard for present day archaeologists. Many present day archaeologists seek inspiration from his passion for exploration. Belief even exists that Robert Braidwood inspired the creation of the screen archaeologist icon, Indiana Jones (Lavietes 2003). His methods employed the revolutionary concept of exploring the correlations between the environment and changes in human activity, which is widely the focus of archaeological inquiry today. Braidwood, Robert J. Prehistoric Men. 8th ed. Glenview, IL: Scott, Foresman, 1975. Print. Braidwood, Robert J. "Robert J. Braidwood." The Pastmasters: Eleven Modern Pioneers of Archaeology. By Glyn Daniel and Christopher Chippindale. New York, NY: Thames and Hudson, 1989. 89-99. Print. Harms, William. "Robert Braidwood, 1907-2003." University of Chicago News Office, 14 Apr. 2003. Web. 24 Apr. 2016. Lesko, Barbara S. "Linda Braidwood 1909-2003." Breaking Ground: Women in Old World Archaeology. Brown University, 2003. Web. 16 Apr. 2016. Mortensen, Peder. "Obituary: Robert J. Braidwood 1907-2003." Antiquity 77.295 (2003): 213-4. ProQuest. Web. 4 May 2016. Watson, Patty Jo. "Robert John Braidwood." Biographical Memoirs. Vol. 89. Washington, D.C.: National Academies, 2007. 22-43. Braidwood, Robert J. and Braidwood, Linda. University of Chicago Photographic Archive, [apf1-02197], Special Collections Research Center, University of Chicago Library. April 1963. Accessed 14 April 2016. Jarmo Expedition 5. University of Chicago Photographic Archive, [apf3-01639], Special Collections Research Center, University of Chicago Library. 6 October 1951. Accessed 14 April 2016. Jarmo Expedition 8. University of Chicago Photographic Archive, [apf3-01642], Special Collections Research Center, University of Chicago Library. 1954. Accessed 14 April 2016.